Presently in Sub-Sahara Africa, there are estimated 1.2 million women and girls suffering from Vesico Vaginal Fistula (VVF) condition with Nigeria having 800,000 of this figure while the northern part of the country carrying the highest proportion of this estimation. 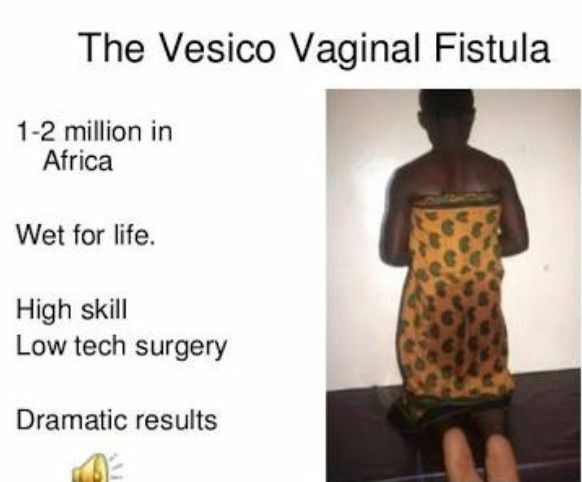 Vesico Vaginal Fistula (VVF) also known as obstetric fistula, is a devastating medical condition developed by women as a result of an injury during childbirth that cause urine to be released uncontrollably; the victims suffer from the disease as a result of prolonged labour. But as devastating as this medicine issue is, it has not really get much attention from critical stakeholders except in recent times when attention is being shifted to it because it cannot be separated from maternal and child health. As at now, about 800,000 Nigerian women and girls are estimated to be living with this social health issue many of whom don’t know how to get their problem solved. Girls as used in this report means those that became pregnant or married off by their parents or caregiver before the United Nations’ stipulated age of 18. Maybe, this medical condition would have been a major medical catastrophe for women in Nigeria, but for the interventions by smart state government and non-governmental organizations such as Medecins Sans Frontieres (MSF) otherwise referred to as Doctors Without Borders. But why Nigerian women be prone to all these avoidable medical challenges simply because they want to give live? This should rather be looking at holistically. In Northern States including Kaduna, Jigawa, Kano, Katsina, Borno, Zamfara, Kebbi, Adamawa to mention a few, the unlucky women in this category do experience series of trauma from social stigma, divorce and in some extreme instances isolation even as their husbands usually take a French leave. But today, succour has beginning to find them especially those in towns and cities. But those poor ones at remote locations are still living with the trauma because they don’t even know it is a repairable condition. This is why a lot still has to be done by all to make help available to them. It is against this backdrop that Gobroadsheet engaged Commissioner of Health in Kaduna State, Dr. Paul Manyan Dogo who bare his mind on what the state government is doing to help women and girls in this category. “With respect to VVF, a lot is happening. I want to remind you that the centre in Hajia Gambo Sawaba General Hospital Zaria is actually one of the best centres that offers a complete care to patients that are down with VVF because the centre is not only reparing but also doing full rehabilitation where the survivors will be taught some skills that once they go back they can easily get integrated into the communities because many of them have been abandoned by their husbands because of leaking urine. But having surgery done, they are dry before they get another suitor or perhaps reconcile with their husbands and go back to their homes. Whether they do so or not, we do provide them with a skill that will enable them take care of themselves. Kaduna is one of the centres that is doing that holistically. We have been working together with partners. We have brought again our working plan for the year which is being prosecuted in detail. I will request that you visit the facility yourselves to see them and possibly engage them. We are proud of that centre. Talking about the distance, it should not be a barrier from accessing the service. You see, when you are providing services not too many people have the skills. And so it is better you concentrate it in one place so that you can give patients the best. If somebody is leaking urine I’m sure such a fellow will be able to find herself to that centre as long as they are within Kaduna state. Or why do we receive patients from other states? So I don’t think distance is a barrier. We are also looking at the possibility of extending the service to other part of the state but then, it has to be gradual as we build capacity. This is because we have to train the doctors that will do the surgeries. We have to train those that will provide them with skills during admission. So it’s beyond just opening the centre but the centre been able to provide the service. We have this in mind but for now, the centre in Zaria is offering the service. We are also collaborating with developing partners to arrange VVF repair in Kafanchan. These are done occasionally as adhoc arrangement. Let me explain something that differentiates the centre in Zaria from other repair terminal. I can do the repair anywhere. But that is not enough what make the centre in Zaria to stand out is a complete rehabilitation of the women. You can do the surgery in any hospital but you cannot call it a VVF centre. Barrau Dikko hospital does carry out the repair for instance but the Zaria centre has concentration of services. In the provision of healthcare, there are supply and demand sides. That is why we need to consider both in anything we are doing. We have people within the communities that we have trained to help us in providing some essential services. For example there are Traditional Birth Attendants (TBA) that we have trained for conducting delivery in the community. We trained them to understand the danger signs of pregnancy and how they can appropriately refer them to the hospital. This comes with some incentives. What happened in most cases is that, many of them will want to deliver at home and that will lead to prolonged labour and eventually develop VVF after delivery. And if you are following, our National Health Suvey (NHS) 2013, only about 34 percent or so try to deliver at our facilities. Many of them think they are considered weak if they go and deliver at the hospital hence the VVF”. Next report on VVF will be personal experiences from survivals. Keep your eyes here.